has himself also rested from his works, as God did from his. One thing that marks the orphan world system that we live in is the absence of the ability to rest. Busy, busy, busy. There is so much to do in too little time to do it. Rushing from work to home, rushing from home to work. Rushing to do the groceries, driving the kids to sports, going to church, etc. Throw in the thousands of media messages that we all get bombarded with every day. Busy, busy, busy. It is exhausting just thinking about it. God is calling each one of us into a deep Sabbath rest in the very core of our being. While on the outside this might appear like pure inactivity and therefore unproductive, I believe the very opposite is true. When we allow ourselves to come into a place in our hearts where we cease from our own works, we are demonstrating in a very practical way that we are relying on God to work on our behalf. This very real form of trust moves the heart of our Heavenly Dad in a way that nothing else can. As long as we try to do all the work ourselves, carrying the weight of the world on our shoulders, we will be trying to do the work in our own strength. When we come to a place where we can slow down in our hearts and quiet the busyness that resides in the depths of our soul, we will find the Prince of Peace waiting for us to join Him. Sure work needs to get done, groceries need to get bought, kids need to be driven to their various activities. But I believe it is our Papa's heart that we enter into a deep Sabbath rest in our hearts where we cease from all our own striving and join Him in His rest. 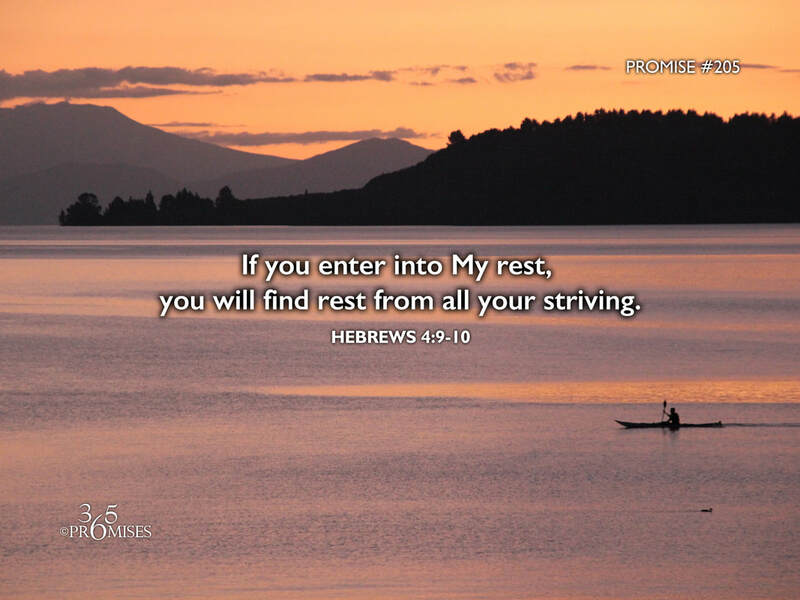 May God give each one of us wisdom today to show us how we can labor to enter into that place of rest.